Math Battle from Daniel Hodge on Vimeo. Today our speaker didn't make it Creek View so the children came back to the classroom and created a Prezi about The History of Manufacturing. Every now and then I come across apps that I feel really can be of a lot of use in education. 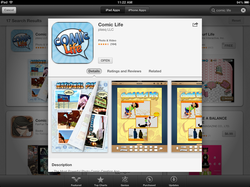 iMovie, Garage Band, Screen Chomp, Comic Life, and Phoster are some of my favorites for documentation. As I spend more time with my iPad in the classroom, I find that I love the creation side of things more that the "teach me something" side of it. I feel that iPads work best, for me anyhow, when used as tools for showing people what you know. 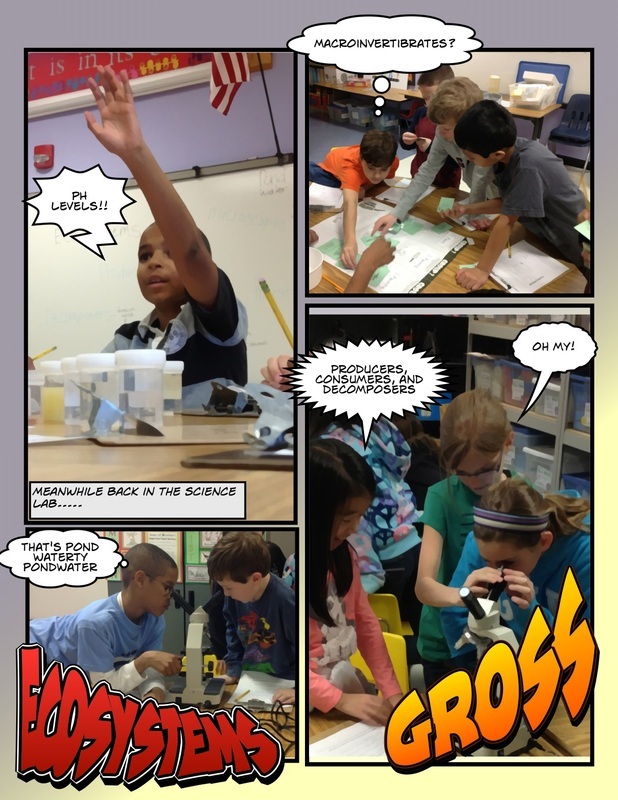 I documented our last visit to the Science Lab using Comic Life. A couple of weeks ago the children had the opportunity to visit our science lab. With the help of some wonderful volunteers, they were able to investigate our upcoming unit revolving around ecosystems. They experimented with microscopes, evaluated pH levels, and sorted and analyzed macro organisms (you noticed I italicized the verbs because that is what the science lab is about...doing science). The children created a Voicethread to help study for their test: https://voicethread.com/share/4124921/ Enjoy. On Tuesdays our reading class is reduced to a small handful of children. In fact, it is made up of only one girl and eight boys. On Valentine's Day our token female was not there so I was left with eight young men to try to capture the interesting history of the holiday. They were reluctant at first, but after a little research on the History Channel's website we compiled some great notes. At this time they split duty and wrote a quick informational piece to inform everyone of the true history of Valentine's Day. Enjoy. Listen up history lovers. Have you ever wondered about the history of Valentine's Day? Because I haven't, until now. I thought it would be really stupid learning about the day of "love" and all. But it's actually really interesting. It's about a Saint named St. Valentine who has many different stories to how Valentine's Day was created. There are many different legends of the first Valentine. Legends are stories that could be true. They could also be based on real people. In legends, facts can be exaggerated to make it more interesting. During the age of the Roman Empire, there was an Emperor. His name was Claudius II. He believed that soldiers fought better when they were single so he banned marriage between men and women. In secret they would, with the help of St. Valentine, conduct the marriages. Saint Valentine was as smart and sneaky as a tiger sneaking yup on its prey, until he was caught and Emperor Claudius demanded he be killed. One of the other legends of St. Valentine was that he helped prisoners escape from jail. He was helping Christian prisoners escape from Roman prisons He got caught doing that, and he ended up imprisoned He was deeply in love with the jailer's daughter. In fact he wrote the first "valentine" from prison to the woman, and its last words were "From your Valentine." Science Lab Trailer from Daniel Hodge on Vimeo. I was conducting a grade level meeting last Friday in my classroom and a stack of the children's writing sat at the edge of my table in front of our Curriculum Support Teacher and new Assistant Principal. The writing was an assignment where children nominated a teacher for our annual Teacher of the Year celebration. It was beautiful because it was one of those rare opportunities in elementary school where adults in the community actually listen to children's opinions. I also take joy in photocopying the children's nominations, and then placing them into the mailbox of the teacher they recognized. Back to my point, the two women at the table began pouring over the writings. They were laughing, sighing, and sharing their favorite sentences aloud with everyone. It was really one of the first times that I had realized the power of this class's work when given an authentic subject to write about. I am excited about sending these works home so that you can read them for yourselves. I am sure you will feel the same sense of pride that I did. Hypothesizing from Daniel Hodge on Vimeo. One of our reading and language arts strands (5.RIT.9) states that we will "Integrate information from several texts on the same topic in order to write or speak about the subject knowledgeably". A quick Google or Bing search brings up tons of information on different topics, but what if you Explored presentations made by students on Prezi's website? Our reading class did just that, and this is what we found. Native American Potlatch from Daniel Hodge on Vimeo. The Science of Dancing from Daniel Hodge on Vimeo. The new Trailor feature on iMovie is amazing. Forces and Motion Preview from Daniel Hodge on Vimeo. Romeo and Juliet in 1 minute from Daniel Hodge on Vimeo. This week the Georgia Ensemble Theatre introduced our children to the world of drama and theater. The first day they arrived the children experimented with the elements of a play based on the folktale "The Lion and the Mouse". The following day they invited our class to a performance of "James and the Giant Peach" that they were conducting at the Teaching Museum. Following the performance, the theater group then returned to our classroom to continue with their lesson having the children write and perform their own short plays. I was very impressed by all parties involved, both actors and children. Untitled from Daniel Hodge on Vimeo. Alright I was a little apprehensive about this iPad thing in our classroom, but apparently it can even make possessive nouns cool. The children in class used some project time to create visual representations of what they have learned about our Solar System in class. The boys and girls in our class dabble with the democratic process by delivering very compelling speeches as to why they would be the best people to represent our class this year. Student Council Speeches from Daniel Hodge on Vimeo. I wanted the children to have an opportunity publish their writing without the stress of their audience's opinion looming overhead. With this idea in mind I resurrected the idea of the underground newspaper. Completely anonymous, "The Germ" is meant to give the children in our class an avenue to publish with added incentive of being part of something that is secretive and in my opinion pretty cool. After watching a video in class about math problem solving narrated by an Italian accented pencil the children decided to take a run at recreating the video themselves. This is what we came up with. 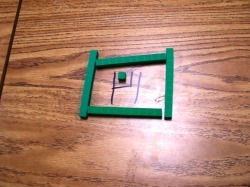 The children were given a task to use Flip cameras to illustrate different scientific terms that apply to the Forces and Motion unit that they were studying. 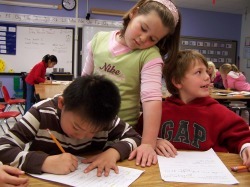 John Dewey once said that, "True education occurs in social situations." For the first couple of weeks the children in our class have been getting to know each other while playing games. In math they are engaging with students that they don't know, and building interpersonal relationships while strengthening mathematical concepts. On "Game Day" where the children brought in board games as part of a Boosterthon incentive, the children were able to engage in larger groups and assume roles as part of a community. It was interesting to see which children gravitated towards which games, and which children chose games where only two played or where four or more students were engaged. Some arguments ensued, while some new friendships were formed, but overall it has been a positive experience for all of the children involved. Here you see where the children used the comic strip medium to translate their understanding of the first ten amendments of the United States Constitution. One Early Release Day the children and I decided to create a day of exploration where we started studying sound waves and ended with a battle of instruments. Using a Voice Thread, I have documented how the students in our class experienced the phases of the moon. This is a very simple experiment that I learned while at Kennesaw State University studying under Dr. Michael Dias. Here is something that I stumbled across this weekend while wandering through the Internet. The website is located at www.xtranormal.com and it is used to turn text into movies. It is really easy to use and makes for a cool new way to relay information or show an evidence of learning for students. This was just something I threw together in about 15 minutes. Now the ball's in your court....what can you do with it? 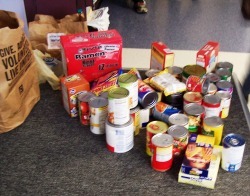 For the past month the children have been bringing in canned goods to help feed the less fortunate in the Atlanta area. I want to thank all of our parents at home for their donations, and for providing a wonderful learning experience for their children at the same time. The children took the time over the past two weeks to count out the cans that our class collected. 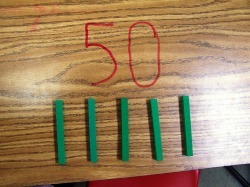 They experimented with many different counting techniques such as counting by 2's, 5's, and 10's. Then I introduced the green place value blocks into the environment to see if the students would be able to represent the number of cans we have collected using the blocks. They were able to master the concept of tens and ones so I decided to challenge them by sharing the number of cans that each teacher in first grade had collected. The children struggled with adding the total number of cans that each of the classes had contributed until they began to join and exchange the place value blocks instead of using the typical algorithm to solve the problem. This 4 day exploration of place value solidified the very valuable concept in the children's understanding of mathematics. If we had blindly entered into this area of the curriculum without a meaningful reason to incorporate the models that the children used they never would have shown the internal motivation to learn about this concept. I was very impressed with their ideas, and learned a lot from their approach. Our Voicethread has to this point been viewed by over 800 people on the web so far. This type of exposure really gets me excited about the possibilities of this program. Previously our work was only shared and commented upon by the children in our class, and possibly a passerby if something was displayed in the hallway. I am constantly looking for the deeper meaning behind something that a child prepares and it feels good to know that someone else in our community is doing the same. Over the past week the children have been following a pretty regimented (for our class) writing schedule. With the introduction of their soon to be published "Young Author's Books," the children have assumed a new role in the classroom as aspiring authors. We began by relating our stories to a book that we were reading in class entitled "My Robot," which was a fictional story about a young boy who received a robot for his birthday. I posed the question, "What would you do if you were to receive a robot in the future?" Of course the children responded with typical answers such as, "he would cook dinner for my family," or, "he would give me money." Then on the second day of the drafting process I decided to turn their stories on their heads and share with them that their robots were all defective and set up more of a cause and effect story line that the children would have to complete. This was wonderful because the humor that came from these conversations sparked a new line of motivation that I feel had been missing from their writing over the past couple of weeks. Children who were reluctant to put pencil to paper were now very excited about writing about how their robot would, "accidentally burn down the kitchen as he prepared dinner for their family." I found myself very satisfied as I watched the children create their own misfortunes, all the while laughing while they hurried to write before their idea's would leave them. I hope I can capture this excitement again soon not just for their motivation, but also for my own.